If you are a fresher to the Embedded, Obviously you have been asked this question. What are the stages of compilation process and Memory Layout of the program. So in this tutorial we are going to discuss Compilation Steps and Memory Layout of the C Program. Normally the Compiling a C program is a multi-stage process and utilizes different ‘tools’. * "Hello, World! ": A classic. The first stage of compilation is called preprocessing. In this stage, lines starting with a # character are interpreted by the preprocessor as preprocessor commands. Before interpreting commands, the preprocessor does some initial processing. This includes joining continued lines (lines ending with a \) and stripping comments. The second stage of compilation is confusingly enough called compilation. In this stage, the preprocessed code is translated to assembly instructions specific to the target processor architecture. These form an intermediate human readable language. The existence of this step allows for C code to contain inline assembly instructions and for different assemblers to be used. Some compilers also supports the use of an integrated assembler, in which the compilation stage generates machine code directly, avoiding the overhead of generating the intermediate assembly instructions and invoking the assembler. During the assembly stage, an assembler is used to translate the assembly instructions to machine code, or object code. The output consists of actual instructions to be run by the target processor. The object code generated in the assembly stage is composed of machine instructions that the processor understands but some pieces of the program are out of order or missing. To produce an executable program, the existing pieces have to be rearranged and the missing ones filled in. This process is called linking. The linker will arrange the pieces of object code so that functions in some pieces can successfully call functions in other pieces. It will also add pieces containing the instructions for library functions used by the program. In the case of the “Hello, World!” program, the linker will add the object code for the puts function. 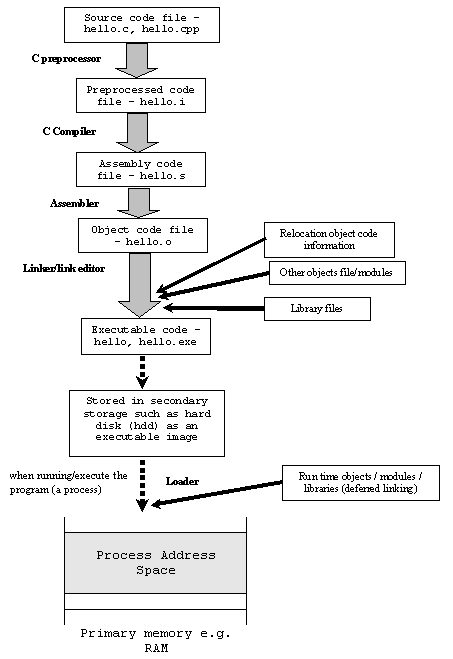 When you run any C-program, its executable image is loaded into RAM of computer in an organized manner which is called process address space or Memory layout of C program. Code segment, also known as text segment contains machine code of the compiled program. The text segment of an executable object file is often read-only segment that prevents a program from being accidentally modified. It will be .bin or .exe or .hex etc. Data segment stores program data. This data could be in form of initialized or uninitialized variables, and it could be local or global. Data segment is further divided into four sub-data segments (initialized data segment, uninitialized or .bss data segment, stack, and heap) to store variables depending upon if they are local or global, and initialized or uninitialized. Initialized data or simply data segment stores all global, static, constant, and external variables (declared with extern keyword) that are initialized beforehand. All global, static and external variables are stored in initialized read-write memory except const variable. 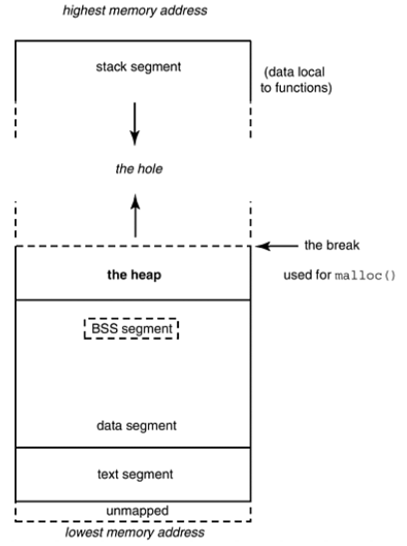 Uninitialized data segment is also called BSS segment. BSS stands for ‘Block Started by Symbol’ named after an ancient assembler operator. Uninitialized data segment contains all global and static variables that are initialized to zero or do not have explicit initialization in source code. So Stack frame contain some data like return address, arguments passed to it, local variables, and any other information needed by the invoked function. A “stack pointer (SP)” keeps track of stack by each push & pop operation onto it, by adjusted stack pointer to next or previous address. Unmapped or reserved segment contain command line arguments and other program related data like lower address-higher address of executable image, etc. Just see the below example. I will tell you the Memory layout using Practical Example. We will see the memory layout of the below program. Let us add one global variable in program, now check the size of bss. Let us add one static variable which is also stored in bss. Let us initialize the static variable to non zero which will then be stored in Initialized Data Segment (DS). Let us initialize the global variable to non zero which will then be stored in Initialized Data Segment (DS). In this tutorial we talked about steps involved in compilation and memory layout of a C program, and its various segments (text or code segment, data, .bss segments, stack and heap segments). Hope you have enjoyed reading this article. Thanks for reading!